Last November we wrote about the opening of the new National Museum of American Jewish History in Philadelphia. The museum stands opposite the Liberty Bell on Independence Mall and one block away from Independence Hall, where the Declaration of Independence and the United States Constitution were written and signed. Yesterday we were privileged to spend more than three hours exploring almost all of the exhibits and watching all of the short films woven seamlessly into the fabric of this beautiful narrative of the American Jewish experience. After viewing just about everything this museum has to offer, we rate it a must-see for adults and children alike. It's worth planning a trip to Philadelphia, where you can also establish a closer connection with the founders of this exceptional country and its continuing and unique experiment with democracy. From the arrival of the first group of Jews in America in 1654 to the present day, the National Museum of American Jewish History chronicles their migration from the east coast to the west coast and every place in between. The museum features family-friendly exhibits that parents and children can enjoy together. For example, a children's gallery encourages children to imagine themselves as 19th century Jews journeying westward to settle and build new communities. Visitors can pack for the journey, build a campfire with "buffalo chips" collected from the prairie, prepare a meal, visit a trading post, and learn about the hardships on the trail, while listening to a soundscape of life on the prairie. 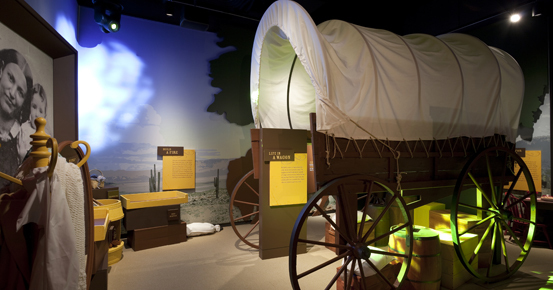 Children can explore a covered wagon and try on pioneer clothing. On the same floor, they can also try on masks in a gallery that depicts how late 19th century American Jews celebrated Purim. Other interactive child-friendly exhibits include a model tenement bedroom where kids can try on period clothing and a classroom with school desks that contain period school supplies and books. The museum features an "Only in America" gallery with a film depicting the lives of 18 Jewish Americans including Irving Berlin, Leonard Bernstein, Louis Brandeis, Albert Einstein, Sandy Koufax, Estee Lauder, Emma Lazarus, and Isaac Bashevis Singer. Here are two vignettes from the film focusing on the lives of Emma Lazarus and Irving Berlin. Enjoy!